This is a follow-up piece to our 15th Anniversary artwork. 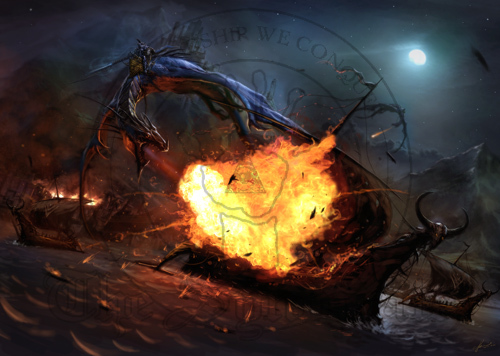 An enemy fleet attacks Arx Draconis and is mostly sunk by this point in the battle with a few remaining ships fleeing and on fire as Syndicate dragon riders swoop down from above. In our second book, Beyond The Legend we tell the story of this picture in more detail.